The Government has yet to make a decision on the format for collecting the incoming property tax, Taoiseach Enda Kenny indicated in the Dáil today. He refused to be drawn on speculation that the tax could be deducted directly from PAYE workers’ wages. Mr Kenny said the Government had set up a working group, under the chairmanship of former civil servant Don Thornhill, who had furnished his report to Minister for the Environment Phil Hogan. The Minister had a responsibility and a duty to reflect on the issues in the report and bring his memo to Government, the Taoiseach said. 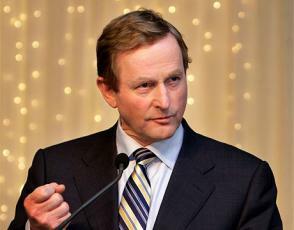 “When that memo comes to Government, it will make its decision in its own time,’’ Mr Kenny added. The Taoiseach was responding to People Before Profit TD Richard Boyd Barrett. Mr Boyd Barrett said there had been an unprecedented campaign of mass boycott and resistance against the “hated and unjust’’ tax since it was introduced. “Even the IMF had to acknowledge the scale of the popular campaign of opposition to the hated household charge,” he added. Mr Boyd Barrett said that at the weekend Labour backbenchers had the jitters when they heard the “outrageous” suggestion that the Government was thinking of trying to circumvent the boycott campaign against the household charge by taking the successor property tax directly from the PAYE sector. Mr Kenny said Mr Boyd Barrett should be ashamed of himself as a legislator to come into the Dáil and deliberately encourage people to break the law of the land. Earlier today, Sinn Féin TD Brian Stanley accused the Government of planning to “pilfer pay packets” with the proposal to deducted property tax directly from PAYE workers’ wages. Mr Stanley appealed to Labour Party TDs in particular to vote with Sinn Féin when the party introduces its household charge repeal Bill in the Dáil this evening. “Our opposing the household charge is not to be opportunistic . . . but because people on low and medium incomes are in dire straits,” Mr Stanley said. He said many of those people were in negative equity, paid large management fees and had already paid thousands in stamp duty. “We must face the Government down on this,” he added. Mr Stanley described the €100 household charge as an “introductory offer” to the Government’s plan to bring in a property tax that he predicted would be a lot higher and could be in the range of “€300 to €3,000, depending on the type of house you have”. He said many people believed the suggestion that property tax could be deducted directly from PAYE workers’ wages was a way of “simply pilfering their pay packets”.